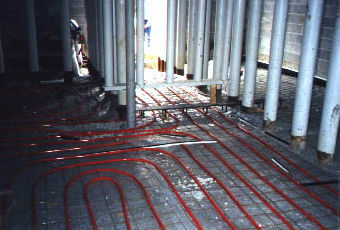 Brings the efficiency and comfort of radiant heating to commercial, industrial and agricultural buildings. 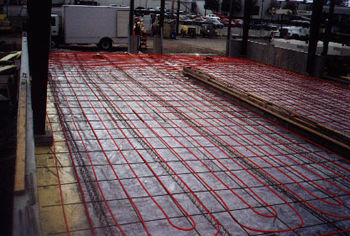 It's the perfect system for space heating, floor warming, snow melting and turf conditioning - and ideal for large commercial/industrial applications. The system uses 1/2", 3/4" or 1" tubes, making it possible to use up to 1,000-foot circuits. 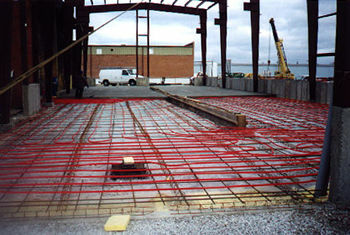 This reduces installation costs while covering more floor area. The ability to deliver high flow rates makes the system ideal for even the toughest heating challenges. Tubing is available in two configurations: non-barrier tubing from cross-linked polyethylene (PEX) and oxygen barrier tubing from cross linked polyethylene (BPEX). These tubes provide excellent performance in radiant applications and provide the system designer with options for component selection. 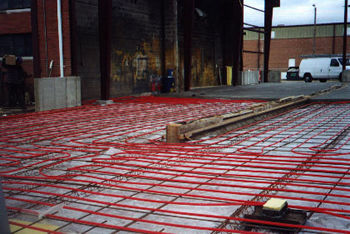 The tubing comes in three sizes - 1/2", 3/4", and 1"
Commercial systems feature the high capacity reset controller, which allows the floor temperature to remain in sync with the outdoor temperature. For every 10°F (5.5 °C) decrease in the outdoor temperature, the reset controller will increase the temperature 1°F (0.5°C) inside allowing for temperature equalization of the structure's heat loss.